10 Bulgarian professionals in marketing went to Sicily to take part in the project named The Italian learning experience in the development and marketing of touristic products. 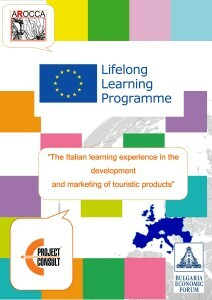 This is a new concept of project in the frame of Lifelong Learning Programme Erasmus+ Programme with the aim to gain experience in their working field and become acquainted with the traditional Italian and Sicilian strategies for the development and the marketing of touristic products. The duration of the project was of 2 weeks, from 01/09/2014 to 14/09/2014, so that we prepared an interesting programme to get the best results possible. The organization involved Associazione Art.Cult. ARocca and the Bulgaria Economic Forum. The group of business managers of 10 differents companies - that arrived 01/09/2014 at the airport of Catania/Palermo - had an informative welcome meeting to learn useful information about Sicily. Regarding the visits, the subject was marketing of touristic products, business knowledge or new and effectivepractices and strategies in this field. The participants could learn techniques practiced in Sicily for the development and the marketing of touristic products to increase their value in their professional careers. The visits took place in 11 relative enterprises in the region of Sicily such as hostels, travel agencies, tour operators or wine houses. They had the possibility to learn about the Sicilian culture and Italian gastronomy and tourism. Furthermore, we designed an awesome cultural programme to improve their business knowledge, critical thinking, strategic thinking ability or even their intercultural communication skills. In this way, they could visit the Jalari Park Museum, Siracusa, Noto, Castelbuono, Cefalu, Savoca, Taormina, Etna, Catania, Aeoliand Islands and Milazzo.